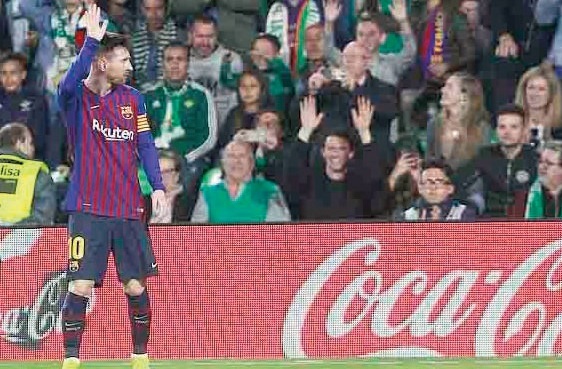 Lionel Messi was given a standing ovation by Real Betis supporters after scoring his 33rd La Liga hat trick in Barcelona’s 4-1 win at the Benito Villamarin on Sunday. I don’t ever remember a night like this [being applauded by rival supporters],” he told Movistar after taking his goal tally for the season in all competitions to 39. Barca coach, Ernesto Valverde says Messi’s treatment from the Betis fans is a deserved recognition for everything he does on a football pitch. “With Messi [in your side], everything is easier,” he said in his post game news conference. “Leo’s performance was extraordinary. The whole stadium applauded him. We’re fortunate to be living at a time when he’s playing football. Valverde changed Barca’s shape for the game against Betis, dropping Philippe Coutinho and playing a midfield four after losing to Quique Setien’s side at Camp Nou earlier in the season.